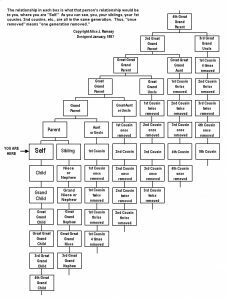 As you work on your family tree, you know it covers your direct lineage. However, there are aunts-uncles and especially cousins to consider. 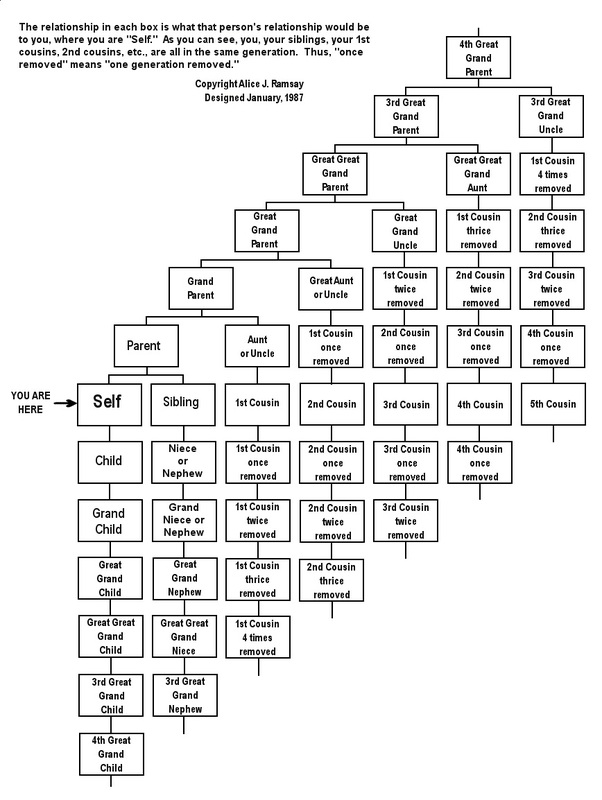 Using this chart done by Alice J. Ramsey in 1987 might help make it clearer of who would be a cousin, or a 2nd cousin or a 3rd cousin twice removed. Again always start with yourself, then a parent, and next their siblings. Note you do a separate chart for each parent (mother’s side and then a chart for father’s side). Yes, there will be blanks with no name for a spot, especially siblings to your parents. As you see, your parent, say a mother, you go back to her parents and then down to her siblings. Any sisters your mother had would be an aunt. Any brothers would be an uncle. If your mother had any half-siblings, they would still be an aunt or uncle (but you could note they were half-aunt). Next, any children of your aunt or uncle would be your first cousins. Then the children that your first cousin had would be your first cousins-once removed. These are known as degrees of cousins. It is easy to see the path by following the chart. The most important is gathering who were the children of each grandparent – great grandparent and so on. The further back you go, the more blanks. It will help you decide which aunts/uncles/ great aunts/great uncles or cousins you want to pursue and learn more about. 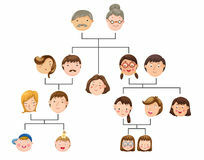 Besides placing names and dates for any of these relatives, if there are any photos of the individuals, add one of them to the chart in their spot. The chart is in jpeg format, so you can save it to your computer and print it. Keep it handle with your family research, both in digital and print form to refer to whenever needed. Photo: Cousins Chart by Alice J. Ramsey in 1987. 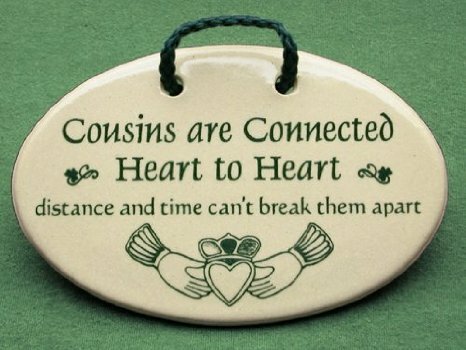 How Many Cousins Do You Have? ?